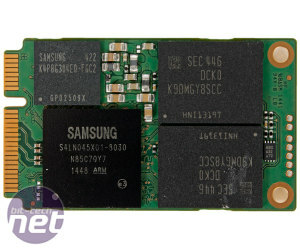 Late last year the SSD 850 EVO launched and brought Samsung's 3D V-NAND technology to a lower price point. They're great SSDs, though we maintain that their benefits will be hard to communicate to the people the EVO range was initially designed for. Higher endurance, speed and efficiency are all great, but for average consumers, and even a large number of enthusiasts, most SSDs are now simply good enough that the only real concern is price per GB. The 850 EVO's pricing has fallen since launch, but even so it cannot compete in this arena with a number of other drives on the market. 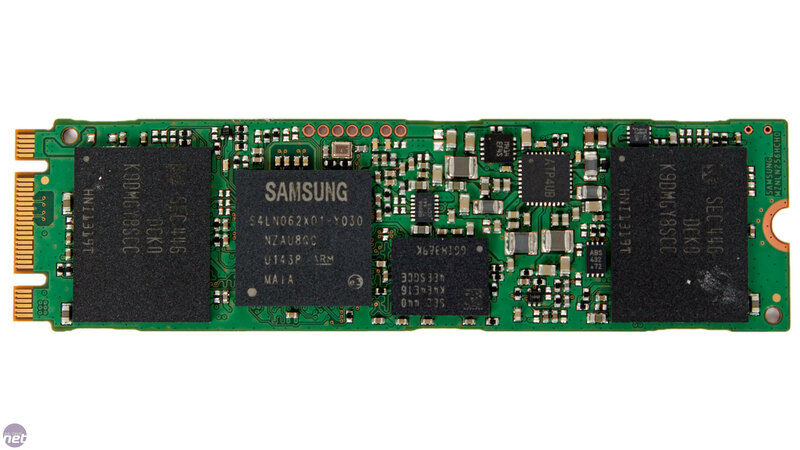 A year before the SSD 850 EVO launch, we also saw its predecessor shrunk down to the mSATA form factor, with Samsung launching the world's first 1TB mSATA SSD. Now, it has again set its ray guns to shrink mode and pointed them at the SSD 850 EVO, bringing the range to both the mSATA and the newer M.2 form factor. While the former features the full range including 1TB, the latter caps out at 500GB. This is because Samsung has limited itself to single-sided, 2280 M.2 SSDs (presumably for maximum compatibility with existing M.2 solutions), which only have enough room to accommodate two NAND packages. Each NAND package has 256GiB of raw NAND inside, since the 1TB mSATA SSD has four packages and the 500GB M.2 one has just the two. In the original SSD 850 EVO, the packages totalled 128GiB, with eight individual 128Gbit 3D V-NAND dies inside. 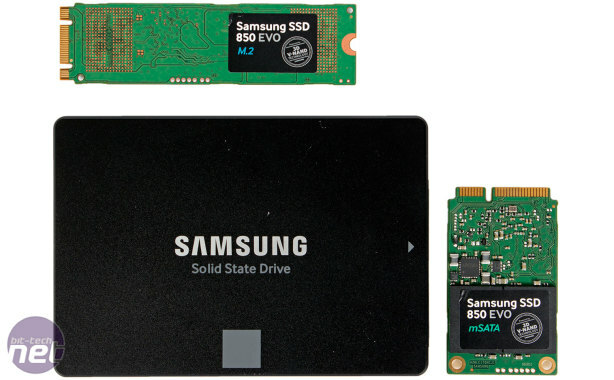 For the mSATA and M.2 drives, however, Samsung has doubled this, impressively cramming 16 128Gbit dies into each package, just as it did with the SSD 840 EVO mSATA. 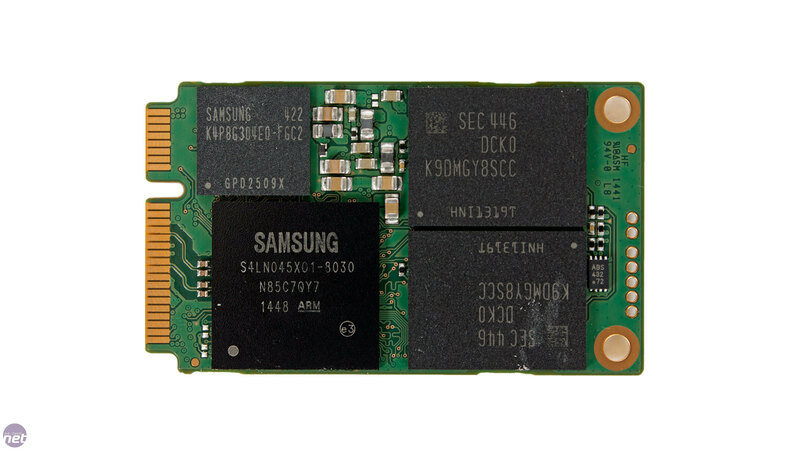 This is seriously dense NAND packaging, and its testament to Samsung's abilities as a NAND manufacturer that it can do this without any real drop off in performance. 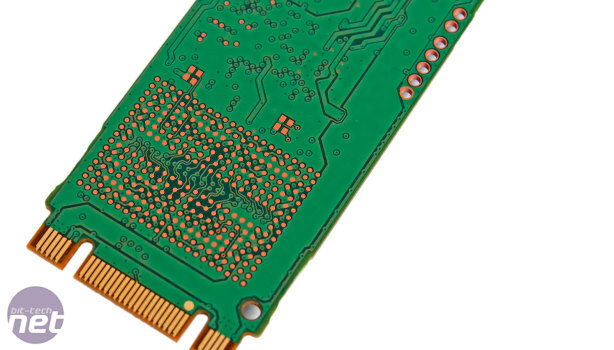 While the NAND is packaged differently, it's the same dies being used, and elsewhere nothing has changed – these are 850 EVO drives through and through. 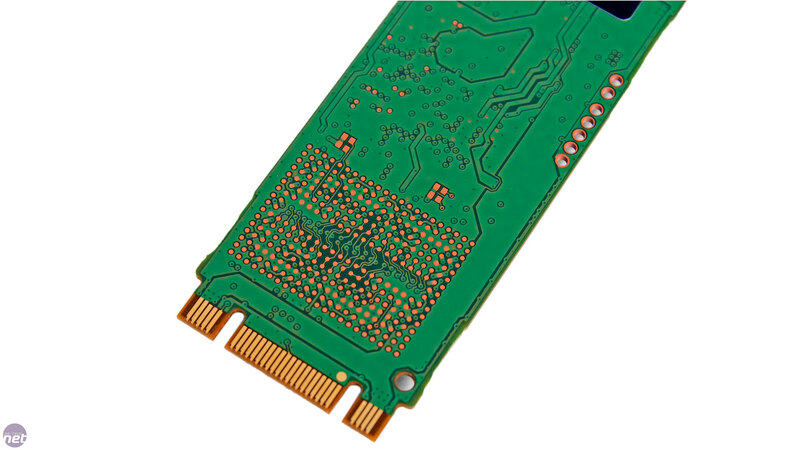 The latest MGX controller (two ARM Cortex R4 cores, quad channel) is used for capacities up to 500GB, while the 1TB mSATA drive requires the older MEX controller (triple core, eight channels) that was used in the 840 EVO. Through firmware optimisations, Samsung has kept the MGX controller's performance up while using less hardware, improving its efficiency. However, it only supports up to 512MB of cache, but the 1TB model requires more cache than this, hence the use of the MEX controller. As such, each of the drives in the new form factors has 512MB of LPDDR3 cache, other than the 1TB mSATA one which has 1GB of LPDDR2. 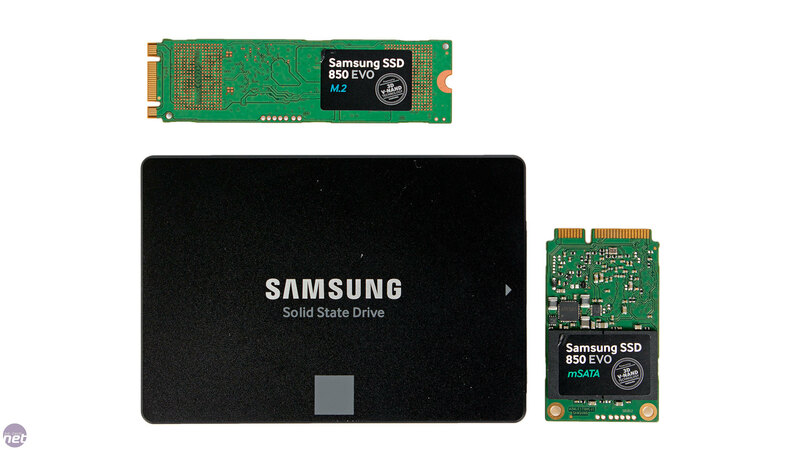 Both drives still rely on the SATA interface; the M.2 drives are not PCI-E storage devices, instead interfacing through the M.2 connector's exposed SATA port and the AHCI driver, just as it would as a standard 2.5in drive. As such, performance is pretty much the same in both models, and on par with the standard SSD 850 EVO, with a few minor discrepancies. For example, Samsung says its Dynamic Thermal Guard is more active on the M.2 models during write operations because of the smaller PCB, although this only seems to have had a minor effect on peak sequential performance. Samsung's TurboWrite feature operates in the same way too, with the same cache size and post-TurboWrite speed in each capacity as in the 2.5in drives. Other features include DEVSLP support, allowing the SSDs to consume as little as 2mW in this low power state. Furthermore, AES 256-bit, TCG/Opal 2.0 and IEEE-1667 encryption standards are all supported, with an easy to use guide on setting them up available through the excellent Magician software, which also includes RAPID mode support. Endurance is also unchanged. Samsung offers a five year warranty on all capacities, which covers 75TBW for 120GB/250GB drives (~40GB/day) and 150TBW for higher capacities (~80GB/day). This is very generous and more than enough for client workloads.